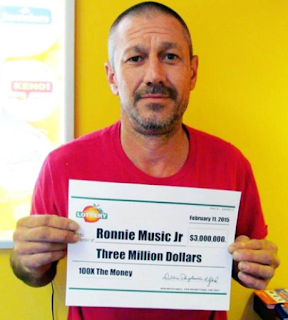 Ronnie Music Jr of Waycross, Georgia pleaded guilty to federal drug and gun charges after US attorneys gave evidence that he used a portion of his lottery winnings from 2015 to invest in a crystal meth operation. Music won $3 million in Georgia Lottery scratch off game in February 2015. The investigation into the situation revealed that his co-conspirators were caught trying to sell about 11 pounds of crystal meth worth about $500,000. Federal agents captured over $1 million worth of meth, firearms, ammunition, vehicles, and over $600,000 in cash in relation to the case. He will be sentenced after the probation office conducts a pre-sentence investigation. Music faces a maximum possible sentence of life in prison. The average lottery winner loses everything within 7 years of becoming a multi-millionaire. Many are murdered or commit suicide. Some, like Mr. Music, blow it all on drugs.